Your skin gets its color from a pigment called melanin. When your body produces too much melanin, dark spots or uneven patches of discoloration can develop. Dermatologists offer treatments to fix the discoloration, but you can get similar results at home with a few pieces of fruit. When applied topically, the chemical compounds contained in some fruits lighten skin, fade dark spots and even out skin tone. Many over-the-counter lightening products contain citric acid and vitamin C -- the same chemical compounds found in lemons and other citrus fruits. Vitamin C is an antioxidant that lightens discoloration and age spots. Lemon juice can even erase an unwanted fake tan. The juice can make skin more sensitive to UV rays, however, so wear sunscreen after applying it. Tomatoes have a similar lightening effect. Unripe papaya contains an enzyme called papain, which boosts skin cell turnover and brightens complexion. Papaya does not inhibit melanin production, so it won't provide substantial lightening. 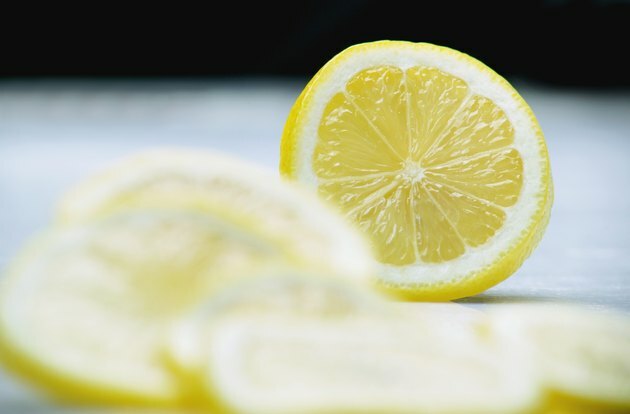 Cut a lemon into slices and squeeze the juice into a small bowl. Add 1/2 teaspoon of white or brown sugar and mix well. Smooth the mixture over discolored skin and allow it to set for 10 minutes -- then rinse. Repeat this once a week. To make a papaya mask, combine 1/4 cup mashed unripe papaya, 1 tablespoon honey and 1 teaspoon white or brown sugar. Mix in 1/2 tablespoon lemon juice and two teaspoons of ground oatmeal. If you have dry skin, add 1/4 cup olive oil. Mix well. Apply the mask to your face and let it set for 15 to 30 minutes. Rinse with warm water. Only use green, unripe papayas for this mask; fully ripe ones contain little papain.